April | 2014 | The Fantastic Flame On! 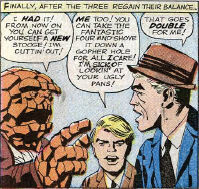 This is one of my favourite panels of the Fantastic Four ever. 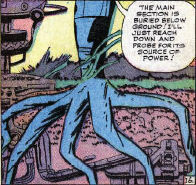 I just love the idea of Reed kneeling down next to this piece of Kirby tech, his fingers probing through the ground looking for the power cables. I also love imagining that, just out of shot, his fingers start dividing into thinner tendrils, like roots. It doesn’t happen – regardless of what he does with his body, he always maintains the basic structure of the human body – but it’s lovely to imagine! It’s hard to sympathise with comic book henchmen. Cities like Gotham and New York are full of bozos who would happily put on any crazy costume if it meant they got to wield a gun or punch a lycra-clad teenager in the face. And to make it even harder, these specific henchmen have signed up with Hitler, who is wearing a tie-dye Klan costume. Sympathy is in short supply. And then they make a completely stupid move, like not questioning a perfectly flat, brand-new blue road in the jungle. Of course it’s Reed who, presumably, was quite happy to lie face-down in the jungle whilst a dozen henchmen trample across his back. The plot continues with Reed heading off to South America (How appropriate is it that Nick Fury’s first modern appearance should feature him getting a hero to do his dirty work? That’s been the basis of most stories featuring him over the past decade or so!). 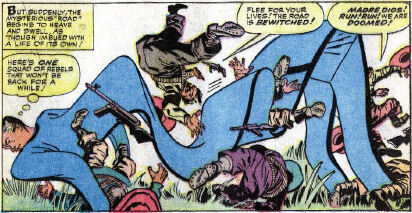 The rest of the team witness the Pogo Plane depart and, despite having broken up the Fantastic Four mere pages earlier, decide that they don’t like being left behind. Hence, Johnny’s impressive ‘Flame On’ here. But of far more interest is the helicopter. The ridiculous, mis-proportioned, top-heavy helicopter. I would love to see the reference used for this panel! Having disbanded the team, Reed returns home to find that an old friend from his days as a soldier in World War II. Yes, it’s Nick Fury, clean-shaven and working for the CIA (presumably his last job before joining SHIELD). He’s dropped by to ask Reed to lend a hand with one of the CIA’s favourite activities – supporting regime change in a South American country. 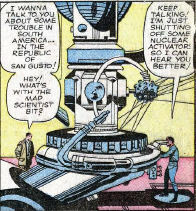 This is the spur for the plot of the second half of the book, but we’re pausing for a moment to note that Reed has a completely spurious nuclear activator whirring away loudly for no reason at all. Note the lack of radiation shielding, or warning notices. Did he not learn a costly lesson about the harmful effects of radiation? Anyway, under the influence of the Hate Monger, the team decide that if they can’t beat each other to death, they can at least go their separate ways. And so, without consulting Sue at all, they decide to call it a day and disband the team. 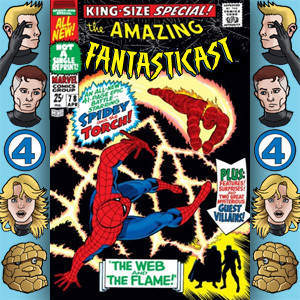 For the next few pages, at least, the Fantastic Four doesn’t exist.